@Nirzar - I was speaking to Sam about potentially having a link that allows users to report bugs - could navigate to a task in phabricator. Could be a good idea (potentially for a future iteration/improvement). Or we could do it for now and only display for logged-in users. It would ultimately be another task. Thoughts? potentially having a link that allows users to report bugs - could navigate to a task in phabricator. I think MultimediaViewer has that when displaying an image fails. Might make sense to check that code. You get the generic modal that says "we don't have a preview for this"
The real problem is that in order for us to set the generic popup in the first place, we know that the edge cases exists, we just don't have a solution for it yet. So I guess it makes more sense to just drop this idea or think of an alternate workflow that could actually help us. Is this task stalled till post rewrite? @Nirzar: Could you upload the mock to Zeplin (or upload the icon to Phabricator). 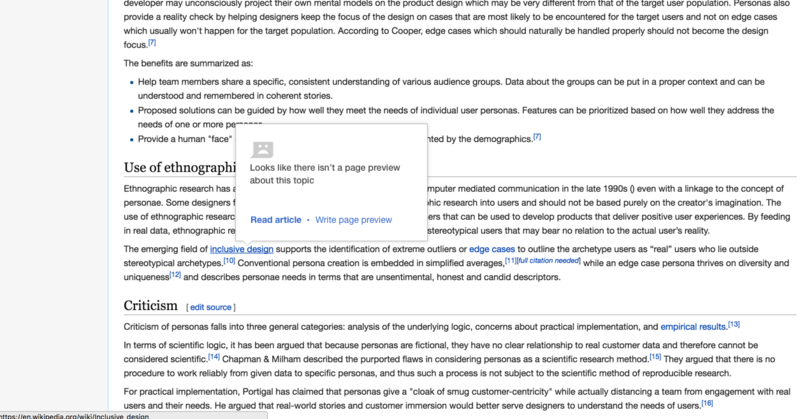 @Nirzar: A couple of trivial nitpicks about the wording: are "topic" and "article" appropriate in all circumstances? @ovasileva, @Nirzar: If you preview the Empty or Redirects to a page that doesn't exist pages here, then you'll see the generic preview. ovasileva changed the task status from Duplicate to Resolved. ovasileva added subscribers: Volker_E, dr0ptp4kt, Quiddity and 6 others.